Rane’s SL range of products including the Rane SL4 allows DJ’s to mix as they would have done using Vinyl or CD’s, without having to run the risk of damaging their disks. The Rane SL4 allows for the interconnection of up to four decks and two computers, providing the facility for artists to use music stored digitally on the computer while retaining the functionality of the turntable or CD deck. The Rane SL4 features four stereo inputs and four stereo outputs on phono connectors. In addition, there are two USB-B connectors and an auxiliary stereo phono input and output. To use the unit, players (CD decks or turntables) are connected to the inputs. The supplied control CDs and vinyls are played which pass control data to the SL4 unit. This control data instructs the computer(s) over the USB connections. Audio is sent back down the USB cables to the SL4 which provides outputs which can be connected to the mixer. The Rane SL4 also has a switchable option of operating at sample rates of either 48kHz or 96kHz. The dual USB ports allow for seamless changeovers between DJ’s allowing two computers to be connected at the same time. The advantages of the SL4 are clear: artists no longer have to carry conventional copies of media with them. With laptop and a small form factor hard-drive, many terabytes of music can easily be transported in a rucksack. Not only does this make the artists job easier as there is no need to carry large cases of media around, the originals can be stored safely. There need be no risk of CD’s becoming scratched or vinyl becoming deformed or overused. ML Executives supplies the Rane SL4 in a standard package that includes the SL4 unit, two USB cables, the power supply for the unit, four stereo phono cables and four of each of the vinyl and CD control media. 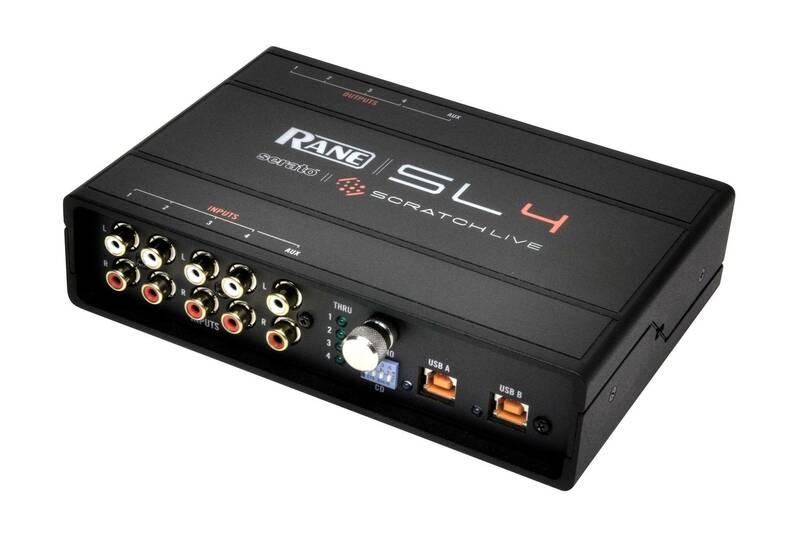 For more information on the Rane SL4 click this link to view the Rane site. For more information on Serato DJ Pro software for PC and Mac, click here. To contact ML Executives about renting an SL4 package or any other production equipment, call +44 (0)1322 55282 or email info@mlexecutives.com.